Did you know that lots of Led Zeppelin guitar riffs were actually performed on a Fender Telecaster? Of course you did: It’s one of the worst kept ‘secrets’ in Rock history, if ever a secret it was. Anybody with a passing interest in Led Zep or even Rock music in general (everybody reading this, essentially) knows that many of Jimmy Page’s finest guitar moments were made not with his trademark Sunburst Les Paul and roaring Marshall stacks, but with a Fender Telecaster plugged into a Supro combo. Indeed, this barely-concealed tidbit of information has become part of Rock Music pub-trivia in much the same way as things like Ozzy’s bat-biting episode in Des Moines (it was already dead, but yes, it was a bit much), Marilyn Manson starring in TV show the Wonder Years as a kid (he didn't) and Keith Richards smoking the ashes of his own dead father (jury’s out...). We love these stories. “When the legend becomes fact, print the legend”. Indeed. Thankfully for us here today, Fender’s legend is one of the true ones. THAT riff from Immigrant Song? Tele. THAT solo from Stairway? Tele. One Tele in particular, in fact. Led Zep aficionados will know that before forming this most mighty of bands, Page was a successful session guitarist, appearing on all kinds of hit songs like Petula Clark’s ‘Downtown’ and Shirley Bassey’s Bond epic ‘Goldfinger’. It was during this time that the legendary Dragon Telecaster, as it has become known, crossed paths with Page. 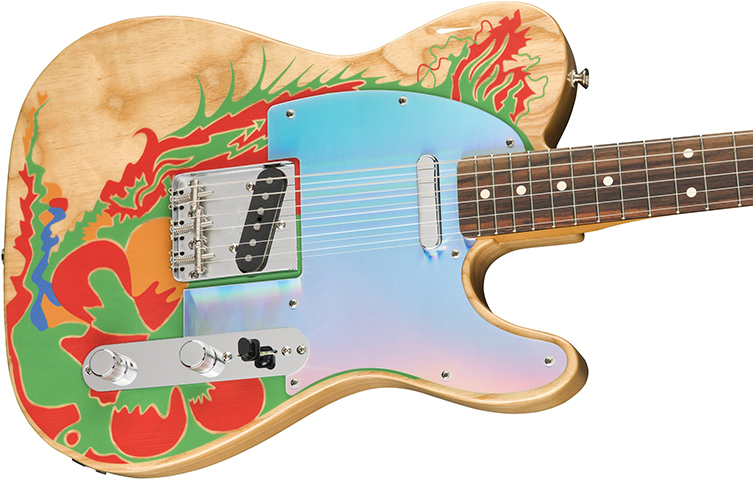 Click HERE to order the Jimmy Page Dragon Tele now. 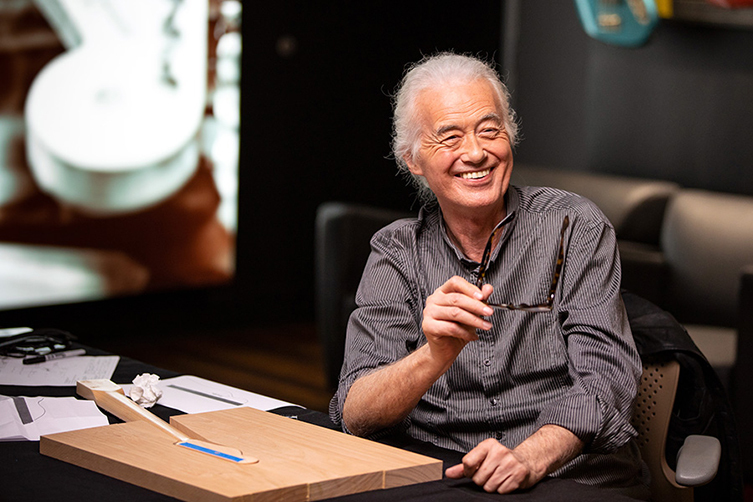 Click HERE to order the Jimmy Page Mirror Tele now. The guitar in question began life as a 1959 Telecaster, finished in Blonde and featuring a neck with a slab Rosewood fingerboard and a White Bakelite pickguard. This instrument was acquired by fellow-legend Jeff Beck at some point in the early-to-mid sixties. Beck used this as a backup to his more famous Esquire model, changing the ‘59’s White pickguard out (it had ‘crumbled’ according to Jeff. What were these people doing to their guitars?) for a home-crafted Black one. Beck and Page became friends in the mid-sixties session scene, with Page helping Beck to secure gigs around London (and putting a good word in with John Mayall to make Jeff Eric Clapton’s direct replacement in guitar legend factory The Yardbirds). Beck repaid this kindness by gifting Page the Telecaster in 1966. It did not take long before Jimmy began his modifications. First of all, he covered it in eight circular mirrors, perhaps inspired by ‘madcap’ Syd Barret and no doubt providing inspiration to a young Edward Van Halen. Later, feeling unhappy with the look, Page removed the mirrors, stripped the finish and ditched Jeff’s homemade pickguard. He repainted the guitar with a distinctive red and green ‘Dragon’ graphic on top of the bare wood. Yes, but why a dragon? Well, that subject is something that Jimmy has been relatively tight-lipped on, other than stating that he wanted to ‘really make it his’. 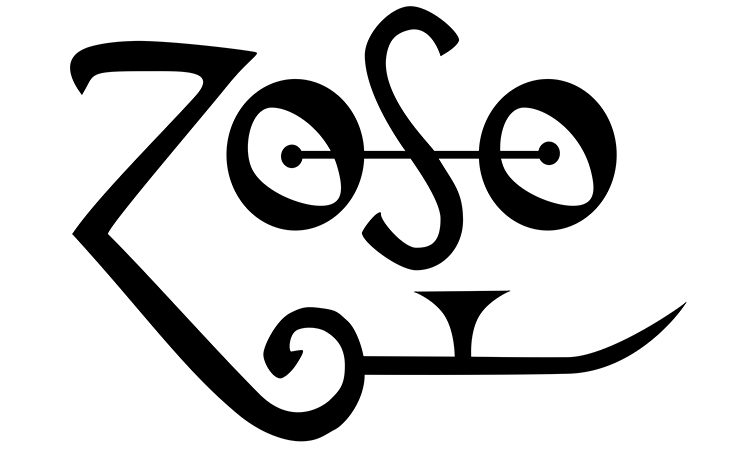 It’s a fact that Page was knee-deep in the occult back then, taking his Led Zep IV ‘Zoso’ alias from an obscure (and frankly dodgy) grimoire of Magical Rituals as well as outright buying ‘Wickedest Man on Earth’ Aleister Crowley’s (Google him, kids) home at Loch Ness. These are but two of many occult-flavoured stories related to Page. We can only speculate about how deep and dark Page got with his interest in Black Magic but volumes relating to the ‘Red Dragon’ are relatively easy to come across. Could Page have been focussing energy for the sake of power and evocation? Or did it just make for good copy? We doubt Page will be discussing that any time soon but, nonetheless, this appears to be the clearest reason for the art. Aside from the mysterious Dragon, Page also added a clear plastic pickguard and sandwiched in a sheet of light-refracting film to catch the stage lights and shoot out all kinds of colours. This is the guitar used on early Led Zeppelin work, both live and in the studio. This is the guitar on which that iconic Stairway solo was played. But what became of it? Where did this mythical guitar go? Nowhere, really, though the dragon disappeared under a further layer of paint. Yes, Page was dismayed to find, upon returning from a Led Zep tour (by which point he was playing his ’59 Les Paul, a guitar he’d bought from Joe Walsh) to find a friend had completely defaced the guitar as a ‘gift’, painting over the dragon completely. Gutted, Page retired the instrument altogether, eventually removing the neck to use on another Tele. So, why has it come back to light now? Well, this is actually Page’s doing. He seems to be unsatisfied by how history dealt with his original Dragon Telecaster. 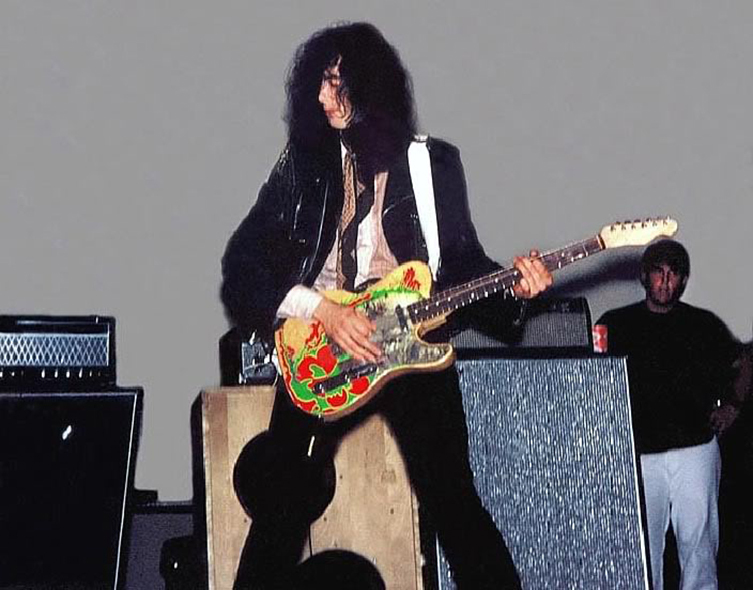 Here is Jimmy himself: “Because of the heritage of this guitar, because it comes from Jeff and goes through the whole first album, I thought it would be really interesting to see if Fender would be interested to do it. I wanted to recreate the original guitar, so it would travel beyond what it originally was”. 2019 also synchronously marks the 50th anniversary of Led Zeppelin forming so now is the perfect occasion to resurrect the magic and mystery of the Dragon. Fender have gamefully taken up the challenge and in fact are releasing a total of four Jimmy Page signature Telecasters this year! Two are production models (one from Fender Mexico and one from Fender USA) whilst the other two will be Custom Shop creations. In the making for over 8 months, reports suggest that Page himself has been involved in the painting process of these new Dragons! 50 Mirror guitars and 50 Dragons will be made by the Custom Shop, each also hand-signed by Page. As for the production models, one is a recreation, by Fender USA, of the 1959 Blonde Tele pre-modification. This model, dubbed the Mirror Telecaster, has just been announced at this year’s NAMM in California. Equally exciting is the news that Fender Mexico will be making a production model of the Dragon Telecaster itself! Now you can summon Baphomet and Mephisto in the comfort of your own bedroom! Please keep your eyes on our website for the pre-order since these are going to be EXTREMELY popular guitars! Rock and Roll is the land of myths and dreams. Jimmy Page and Led Zeppelin are part of that enduring myth for us all. Did Robert Johnson really sell his soul to Satan at the Crossroads? Did Michael Jackson really try to buy the skeleton of John ‘Elephant Man’ Merrick? 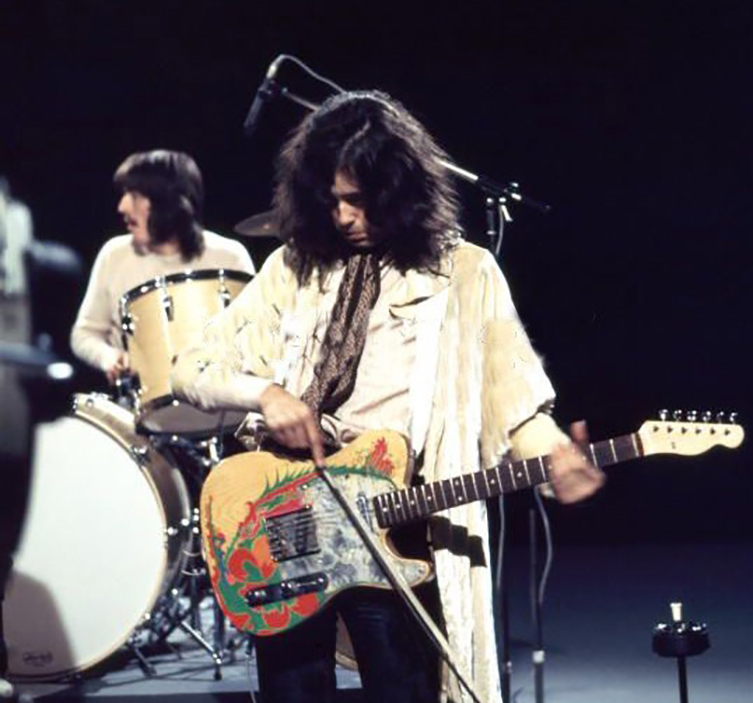 These answers may never be known but whatever the mythology and supposed mystery behind Jimmy Page’s Dragon Telecaster, you’ll at least be able to get your hands around this myth and own a little part of history for yourself. Check out the new Fender Jimmy Page Signature Telecasters here and get your Pre-orders in!